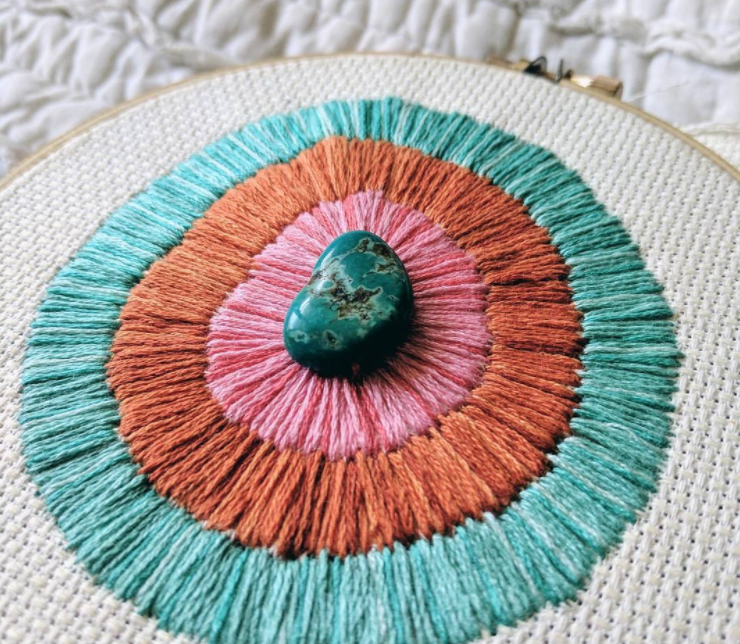 Brad Duncan shares his passion for the art of embroidery in this personal essay, which includes images of his original works. I have to confess I don't know anything about embroidery. 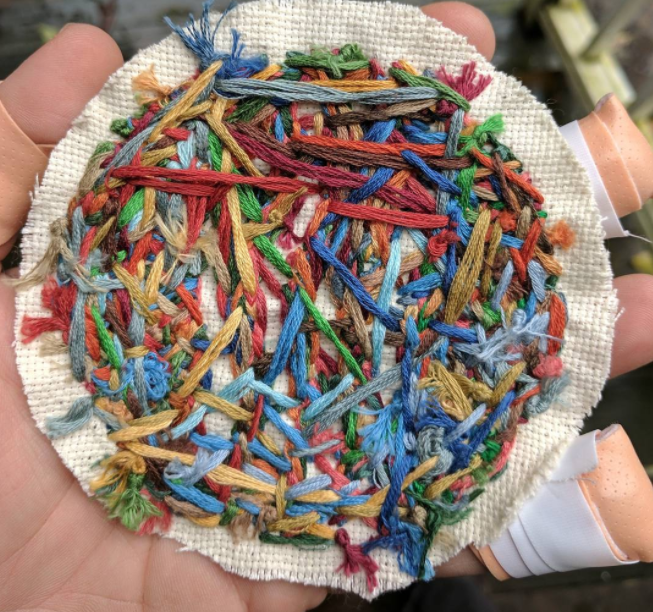 I don't know the names of any stitches. I don't know anything about the history of the art form. I've never looked at a pattern nor would I know how to make one. I started on a whim with a portrait of a friend's dog. I went to a craft store and picked the colors I thought he looked like and just started. Now I can't seem to stop. I've tried my hand at a lot of different art forms over the years. I used to write short stories, then poems, then I wrote songs and learned to fumble a bit on piano and guitar. I had said for years that I always wanted to be able to draw and then for years continued to not even try. I never wanted to sit through the hours of practicing. I wanted to sit down and draw a complete picture. Same with piano and guitar, sit down and play full songs. With embroidery however it's almost always impossible to start and finish a piece in one sitting, it simply takes too long. After throwing my sleep schedule off with many late nights losing track of time, I learned I can set it down and it will be there the next day. 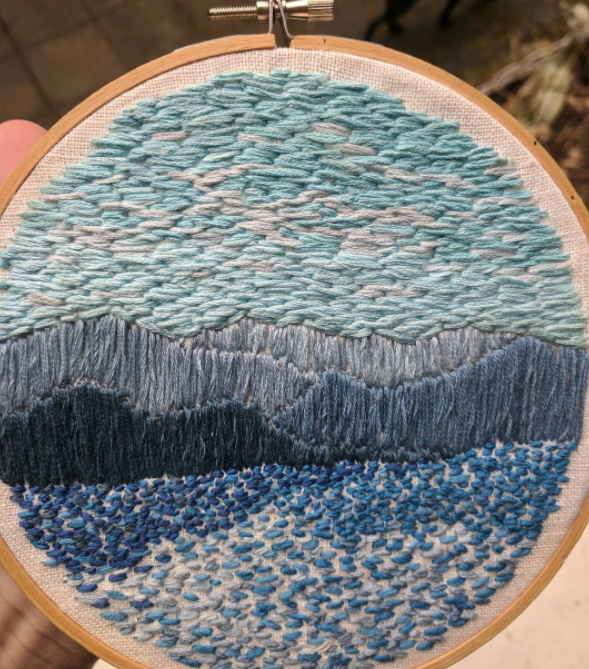 As a piece fills in over the course of a week or two and I notice the parts I rushed look sloppy, I learned to slow down and not breeze past messed up stitches. When I started having too many ideas to stitch, I began drawing. 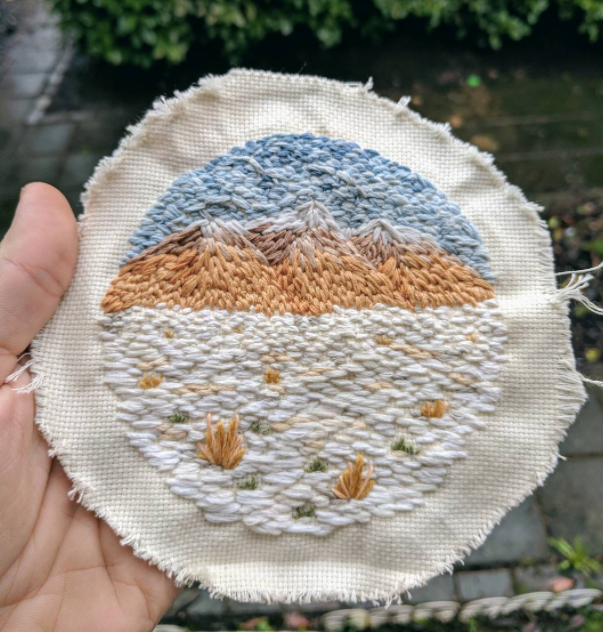 I could make an image in a fraction of the time it took to stitch something! So I spent a year or so filling up a few notebooks with drawings and watercolor paintings. But nothing ever looked as good as when it was embroidered so I restocked my hoops and fabric and got back to it. At first my interest was in creating scenes and landscapes, recognizable objects: a car, a tooth, a cat. 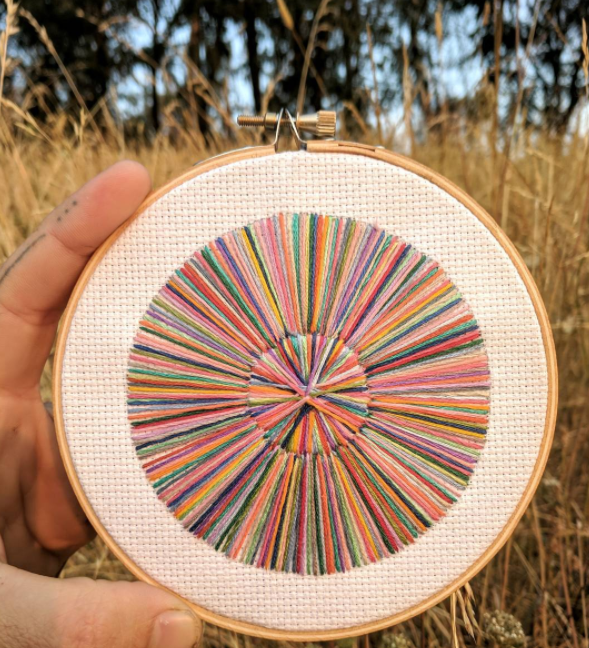 But as my collection of threads grew in number and variety, my eye began to be drawn more to the interaction between the colors themselves, the process of stitching, and the lessons I was learning. Last year after a severe bout of depression, a counselor I began seeing suggested mindfulness meditation. He said to understand the mind you must observe the mind. So I began an inconsistent but earnest effort towards a daily practice. There would be times when my mind fluttered like a moth down a hallway, impossible to catch. Restless thoughts of boredom suggesting any other activity than sitting still. There would be a week where I didn't do it at all. My counselor suggested acknowledging the activities I do in my life in which I am already mindful and present. I thought of hiking in the redwood forests as a kid, crossing a log over a creek. I thought of laying sprawled in some strange position on the floor, lost in a book. I thought of fabric stretched tight on a hoop, held close to my face, holding my breath as I prod the back with the needle. Not there...there. I pull the thread through and my held breath sails out. I lay the thread down where I want it as my breath draws in and I pull the thread through the back. On and on and on. Breath draws in, thread slides through. At times in our lives we have brilliantly clear epiphanies that strike us like a cold shower. You're body buzzes with the spark of discovery, the warm hum of astonishment. "Of course it's this way!" you think and your worldview adjusts to a new reality. More often, I have found, that realizations come slowly, unfurling at a plant's pace. They culminate from many different situations and you adapt them into your worldview bit by bit. 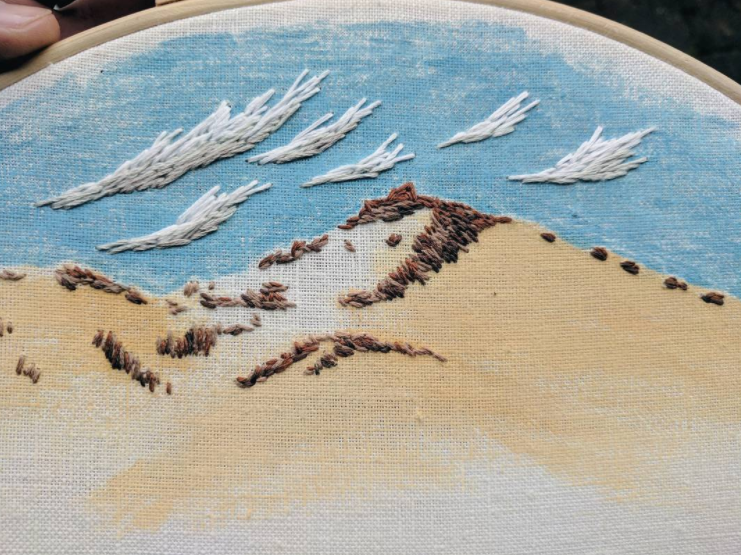 Embroidery can be a fitting metaphor for this aspect of our lives. Progress is slow and meandering at times. Things may seem unrelated or misguided, but bit by bit the image forms until it is finished and the lesson learned. The lesson that life is a slog punctuated by moments of euphoria. We end up seeking these moments so forcefully we miss the value in the slog. There is another life lesson that embroidery serves as a useful metaphor to illustrate. The order and design of the front and the chaotic smattering of stitches and knots on the back are like the dual nature of reality. There can be no joy without pain. There can be no life without death, no order without chaos. Each ones existence is dependent upon the other, like a coin. You cannot have a one sided coin. But we live our lives trying to keep the coin in our favor. We fight against reality and suffering comes from trying to hold on to how we think things should be. Peace comes in the moments I remember that the front and back are the same thing. When I am making something I set to it with an intention and a vague image of the completed piece. If I allow it the space and time, at a certain point it begins to take on a life of its own. If I hold rigidly to my plan it doesn't work. Each stitch is an opportunity to be present in the slog. Every piece is a long meditation, a practice of mindful awareness in each moment, stitch by stitch, bit by bit, until god willing the lesson is learned. 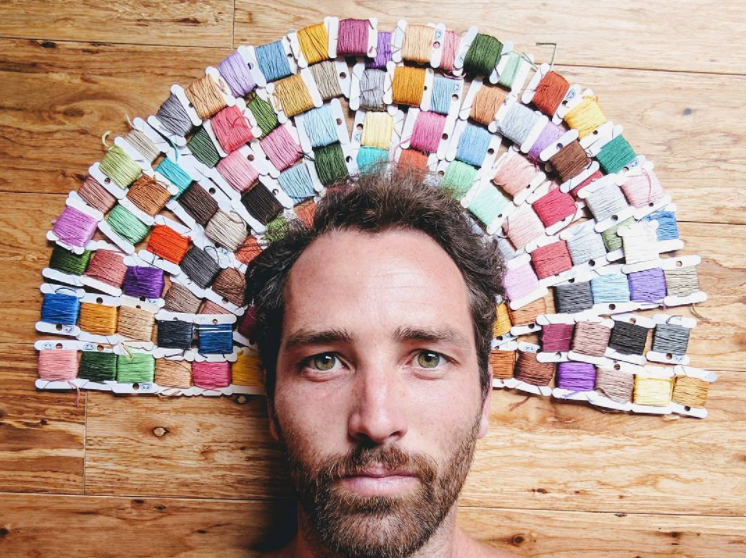 Check out more of Brad's awesome embroidery on Instagram, or buy one of his pieces on his Etsy shop. Brad Duncan was born and raised in Santa Cruz, CA. After spending a decade in Seattle he packed up to live a nomadic life on the road. He and his beloved dog, Franny, are currently in Oregon.